I like the look of gold leaf, but don’t have the patience to use it. I like the control I get by using a brush better. Many of artists must feel the same because this subject comes up very often. Luckily there are many metallic watercolors available. I’m going to start chronologically with what I’ve tried. This may have been the first metallic gold paint I tried that wasn’t acrylic or enamel, so obviously it worked better with watercolors. Holbein Irodori Antique watercolors are designed as a palette for Chinese and Japanese painting. Most of them are more opaque than western watercolors. Paint qualities: Antique Gold has a very nice shimmering quality. It works well as a transparent shimmer over other colors, but compared to other choices it’s not great for building up an opaque coverage. As with most of these paints, reproduction requires some photography tricks. Some paints show up better in scans than others. Japanese watercolors made for use in Sumi-e painting. These come in individual round ceramic dishes and are available in Reddish Gold, Gold, and Silver. They are also available as part of a set of 6 with red, white and black colors. Paint qualities: Very opaque but easily diluted as well. Making solid opaque lines is easy. The paint is not as shimmering as other paints, and has more of a dull finish except when turned towards a light source. Fun techniques: After rinsing your brush the rinsed paint will float on top of the water. 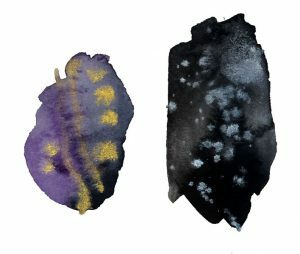 It’s possible to lay a sheet of paper on top and pick up the paint flecks. 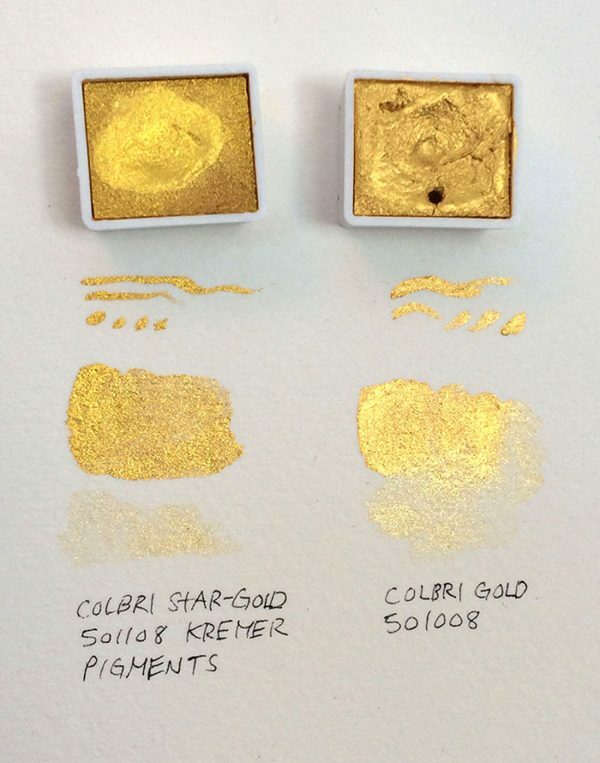 Kremer sells loose pigments as well as ready made watercolor in full and half pans. 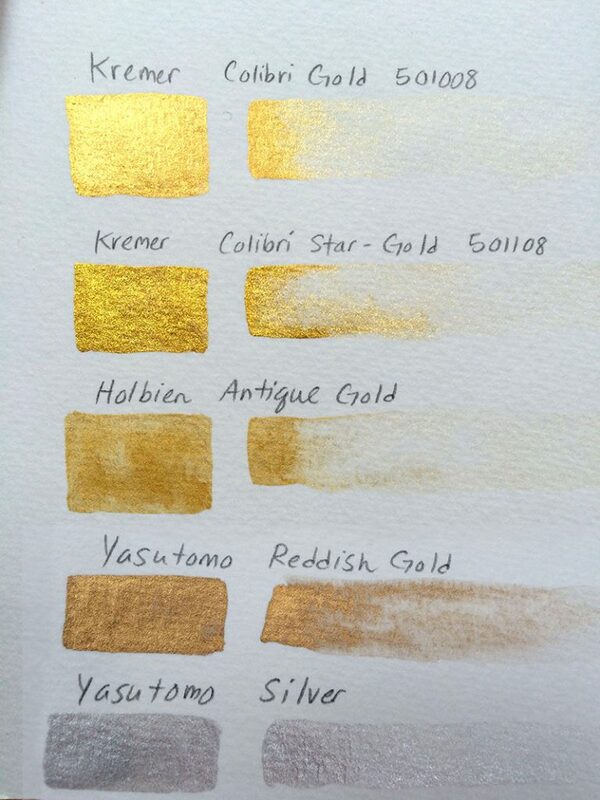 The metallic paints made of mica and watercolor medium are available in various shades of gold, silver, and bronze. Paint qualities: The sparkle quality is high with these paints. 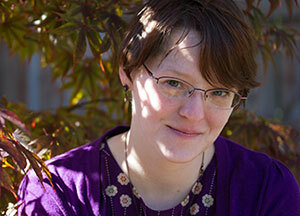 Colibri Star-Gold (501108) quickly became my favorite. 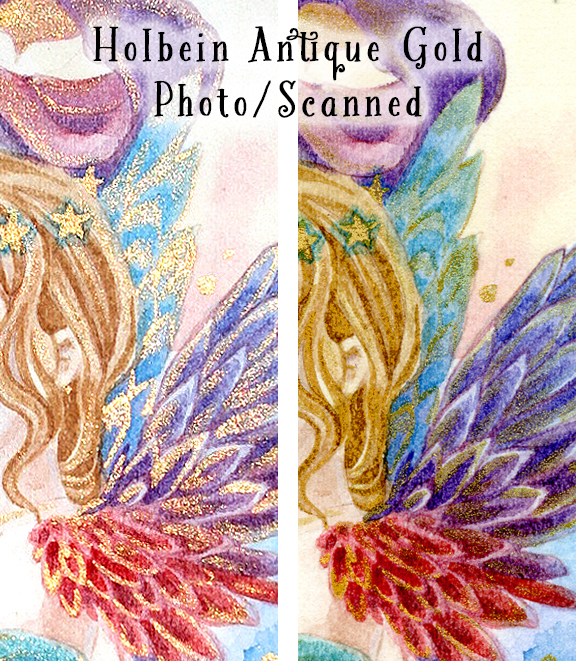 Compared to Colibri Gold (501008) which is slightly flatter, Star-Gold is has more shimmer. Paints are easy to make both very opaque or use as a diluted wash over other colors. Fun techniques: In rinse water these pigments will sink to the bottom. Pour off extra water to use the remaining pigment or try pouring it off onto paper. Calligraphy: Yes! I was excited to discover that this worked and looks raised when dry. Pick up some wet paint with a brush and add it to a pen nib to draw with. Where to find: Available at Kremer Pigments online shop(under ready-made watercolors) or at their shop in New York. Paint qualities: Paints take a little more time working up a wet area in the pan to get an opaque color than Kremer. Otherwise they seem really similar to me and I like the variety of shades. Try dripping onto wet watercolors for star-like effects. In rinse water these pigments will sink to the bottom. Pour off extra water to use the remaining pigment or try pouring it off onto paper.